Spring is the perfect season to use that cotton yarn in your stash, the time to work up something nice for your home. 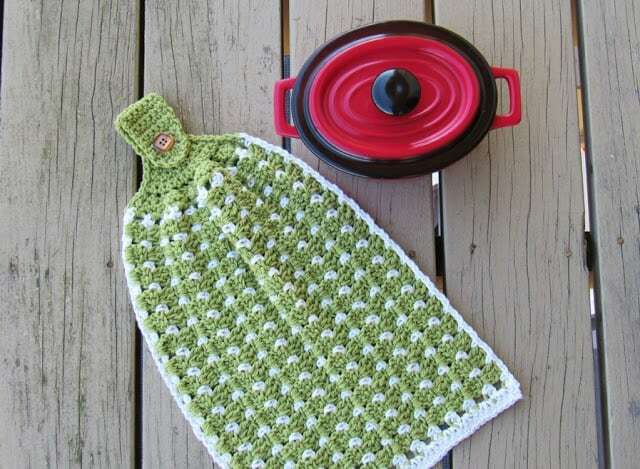 So why not crochet some kitchen towels to match your decor? 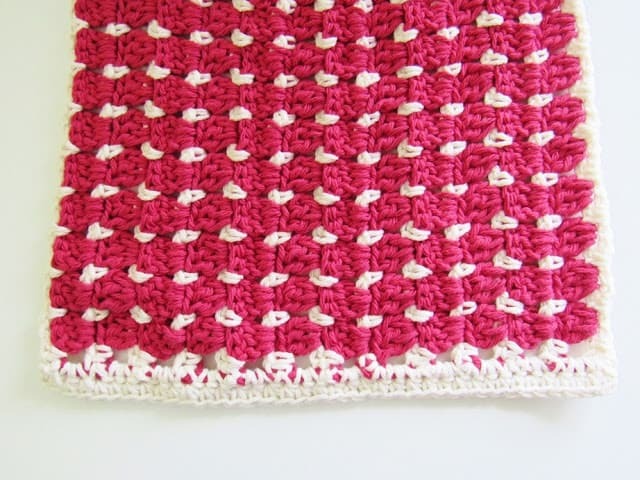 This crochet pattern is designed using the Block stitch but without the hassle of fastening off every row. If you haven’t seen my Facebook video on how to change colors every row without fastening off, you will learn something new today. So grab your hooks and get started. 17 1/2 inches long and 10 1/2 inches wide after buttoning up. Note: This towel is worked sideways. The pattern refers to the colors of the green towel. With H hook and cream color yarn, ch 52. The initial chain is a multiple of 3+1. Row 3: This row is worked on the same side as the previous row by picking up the cream yarn that we dropped on the right edge of your work. 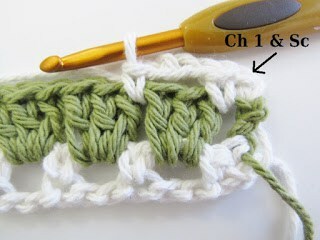 Insert your hook through the top of beginning ch-3 of the previous row and pull through the cream colored yarn, ch 1 with the yarn joined. 1 sc on top of beginning ch-3 in same place where you worked the beginning ch 1, 1 sc in the adjacent space between beginning ch-3 and next dc, *(ch 2, skip 3 dc, 1 sc in next space between the 3dc groups), repeat from * across, 1 sc in last marked st while joining the green color back. Repeat rounds 2 and 3 eleven more times and you end in a Row 3 repeat. Fasten off the cream color after you pick up the green loop. 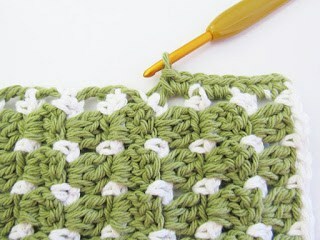 Repeat Row 9 until the green gathered part measures 6 1/2 inches from the beginning. 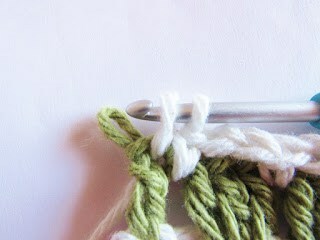 If you want to make it longer you just repeat this round before proceeding to the Buttonhole row below. Last Row: Ch 1, skip next st, 5 dc in next st ( the 3rd st), skip next st, sl st into the last st. Fasten off. Work the first row on the wrong side of your towel. It is up to you which side you want to pick as the wrong one. Row 2: Ch 1, 1 sc in same st as ch 1, 1 sc in each st across to end. Fasten off. 1. 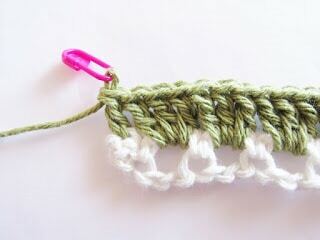 Make a round of sl st around the top gathered green part of your towel to even out the edges. 2. Weave in any ends left and sew on the button. 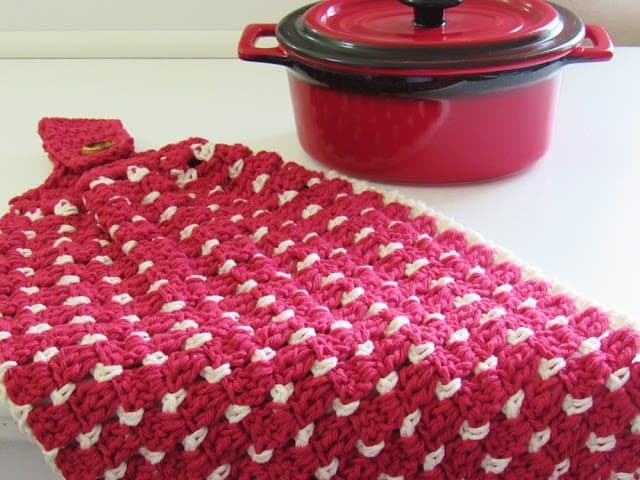 You can find a matching dishtowel pattern here: Dishtowel. 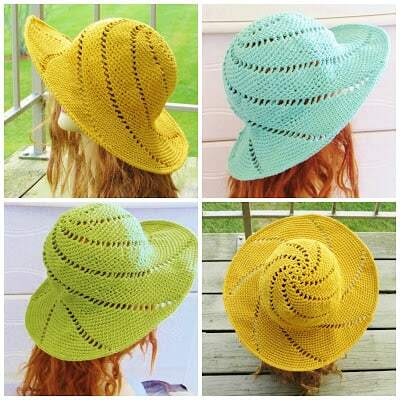 Check out my full collection of crochet patterns here, Pattern Gallery or check out the two famous spring patterns below. 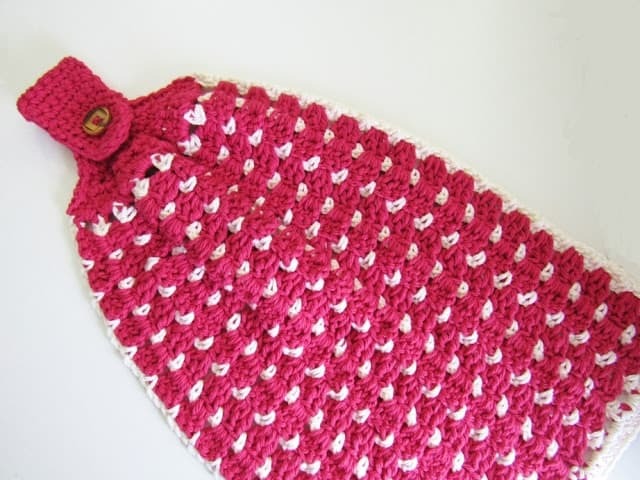 Wonderful pattern for dishtowels and dishcloths!!! Hi Patty, I am glad you like the patterns. Thank you for visiting my blog.